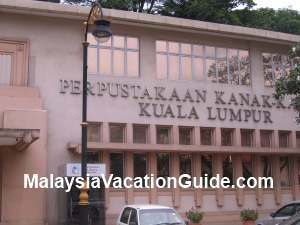 Kuala Lumpur Library or Perpustakaan Kuala Lumpur is located near KL City Gallery and Dataran Merdeka. This is the place to go if you are looking for books to read or simply need a place to do your research work. This air-conditioned building was built in 1989. 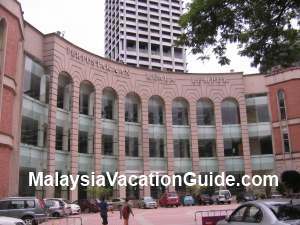 This library is managed by Kuala Lumpur City Hall and has quite a complete range of books for your reference as well as borrowing. 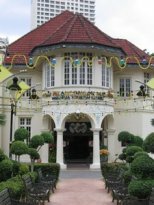 The membership of the library is open to anyone who is four years old and above and residing in Kuala Lumpur and the surrounding areas. The adult library and children library are located in separate buildings but is within walking distance of each other. Membership fee for adult 13 years and above is RM6 (Registration) + RM10(annual fee). 3 books and 1 CD can be borrowed. Life membership is open to adult 21 years and above for RM150. 8 books and 2 CDs can be borrowed. Children 4-12 only need to pay RM6(Registration fee). 3 books can be borrowed. The Children's Library also help to arranged activities such as Board games, Computer Class, Video Show, Storytelling Sessions, Puppet Show and Exhibition. The duration of the borrowing period is 14 days. Renewal for another 14 days can be done via telephone. 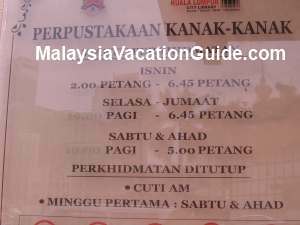 Fine of RM0.10 per day each book is imposed for late return of each book up to 14 days. After that RM0.20 per day fine will be imposed. 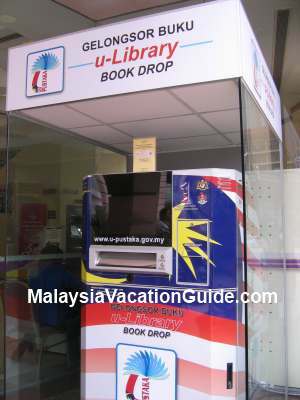 You can return your books by dropping them here. The operation hours of the library. Tuesday-Friday: 10 am to 6.45 pm. Saturday and Sunday: 10 am to 5 pm. The library is closed on the first Saturday and Sunday of the month. It is also closed when it is a public holidays. 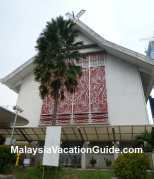 Take the LRT trains and alight at Masjid Jamek station. 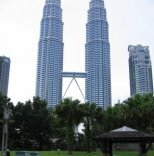 Take a walk towards Jalan Raja and go towards KL City Gallery. The library is located just beside the Gallery. 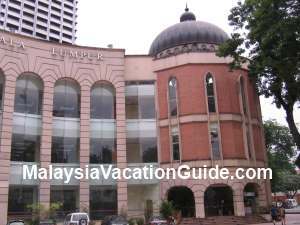 The KL Library has 9 branches in various towns to encourage intellectual development of the peoples within the vicinity. The 9 branches are located at Taman Tun Dr. Ismail, Jelatek, Desa Tun Razak, Gombak Setia, Pantai Dalam, Cheras, Setapak, Bandar Tun Razak and Sentul.